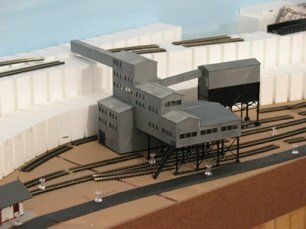 After developing your concept, or theme, you're now ready to consider various model railroad track plans. 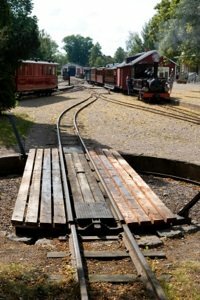 The information on the first part of this page has to do with the basic building blocks and various schematics that can be used in forming your basic track plan. You will probably want to use the information here in conjunction with that on the "Layout Design 2" page, as you form your overall plan. When laying curved track, you should use an easement, which eases your way into and out of the curve. In other words, start your curve with a larger radius, then ease into the tighter radius, then come out of the curve again with a larger radius. Your trains will look better going around the curve that way. You can use turntables, wyes or reversing tracks as a way of turning your trains around (without having to manually lift them up off the tracks). You may need a runaround track to keep your engine or train from being blocked in on a branch line, and to allow drop-offs without tying up the mainline. A configuration called a “ladder” is used in train yards to help in sorting trains and forming consists. A Spur is any short branch off the mainline that can be use to service an industry, station or other facility. A team track is a branch or spur off of a mainline that can be used to unload railroad cars to trucks for local distribution of goods. You can use any of the above as building blocks in various combinations to form the trackplan that meets your needs. Now that you know about the basic different building blocks for track planning, you can start brainstorming about how you want your basic layout track plan to look and operate. One way to do this is by sitting down with paper and pencil (I emphasize pencil here) and just start drawing some ideas, based on the concept of your railroad that you have decided on in the previous sections of this site (the "Design page 1"). You will most likely go through several pieces of paper before deciding on your general layout plan here. You may even keep going back to it over the next few days or weeks to try to make it better. It may help to review the section on train layout design elements on the "Layout Design 2" page. You could make a very detailed plan on paper before you start building if you wish. However, you will probably still change it several times as you get into physically laying the track. Sometimes things that look good on paper just won’t fit in the space you have. It helps to use graph paper with each grid being a scale measure of your layout. This will help you to be realistic in your drawings so that your trackplan will more likely fit into the space you have available. Frankly, what I personally like to do is just use paper and pencil to get a good, general idea of how I want it to look, then go ahead and start building benchwork. You will have time while you’re building the benchwork to go back over your drawings several times to refine your ideas. Just be sure that your plan is good enough in the beginning that you won't have to later redo your benchwork because you forgot to put in a loop or branch that you absolutely must have. Once your benchwork is built you can start putting down some tracks loosely on the subroadbed and see how it looks and how it might operate. This will help you further refine your plan when you can see it in 3D. If you are planning on having grades, or elevations, in your track plan, or if you want to find out more about making sure you have proper clearance for your tunnels and bridges, you may wish to visit the page on Grades and Clearances. I usually spend quite a bit of time on my model railroad track planning. I try to imagine how my trains will travel, how they will operate, how many trains I want to have running at the same time without having to worry about crashes, how they will spot cars in spurs, how they will pick up the empty cars, how to avoid tying up the mainline, etc., etc. I do this on paper at first with lots of different drawings of different parts of the layout. When I get to see how it works in 3D on the subroadbed, integrating the track with the terrain, the plan changes further. If you know what structures you will be using, you can include them in your planning at this time and see how the trains interact with the buildings as well as the terrain. You don't necessarily have to use completed structures here. You can just use mock-ups or just a piece of cardboard cut out to match the dimensions of the base. 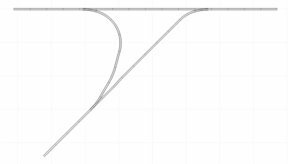 Eventually, after considerable thought and deliberation, I end up with a model railroad track plan that I'm happy with, that I think is interesting, somewhat realistic, and should be fun to operate. A great reference on creating model railroad track plans can be found in John Armstrong’s book, Track Planning for Realistic Operation. This is considered by many as the bible for model railroad track planning. I would highly recommend it if you are planning anything more than a very simple layout. The Mad Trackplanner's Page - Lots of small N-scale layouts. Another way to design your trackplan is to use model railroad track planning software. This is described in further detail in the "Software" section of this site. From "Track Plans" to "Homepage"